My Transformation - in just 90 days! In August of 2009, I was sitting on the second step of the stairs and found myself out of breath while doing up my shoelaces. By the end of October, I was able to run up the stairs without even realizing that I had done so. In just over two months ~ I felt more energy, pep, and alertness than I had felt for a very long time. People with whom I work have commented . . . not only on my obvious weight loss ~ but on the new glow in my eyes and the clearness of my skin. 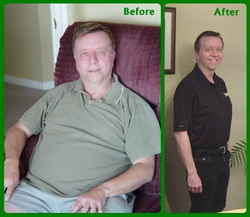 I went on to release 44 lbs and am now 8 lbs below my goal weight and am on one of the ISAGENIX maintenance programs since November of 2009 and have maintained my new body. I did not realize the effects of the impurities in my body and overall health. I am so glad that I have discovered this amazing, affordable, cleansing system. As people began to notice, they asked me what I was doing. I shared my story and told them about the products. Most of the people I spoke with wanted to do the same, and so I signed them on. So, now I am also receiving a regular residual income which is increasing gradually. It is only a matter of time before I reach financial freedom. This will mean that, although I love my current job as a teacher, I will be able to take early retirement at the end of June, 2013, so that I can spend more time with my family and friends, and choose to do what I want, when I want. Now, that's true freedom! It is my desire to share the benefits of health and wealth with as many people as I can. If you'd like to experience improved health and wellness and/or a second stream of income, please contact me at: alansteed1951@gmail.com or call me: 705-241-2570. Don't cast a clout, until May is out??? One of my most exhilarating moments! Countdown..... just 44 days to go! What a wonderful way to wake up! !